Within a given type of paint, colors can be mixed. Pigments and dyes mix by what is known as the subtractive mixing process. When pigments are mixed, the wavelengths of color interact, causing some to cancel each other out. Most people are familiar with the primary colors of pigment: red, blue and yellow. When pure colors are mixed in equal quantities, black is the result. 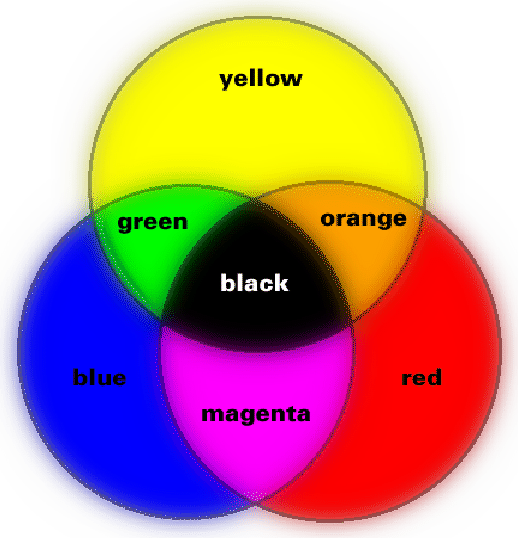 The primaries can be combined to form the secondary colors of magenta, orange and green. Further mixing of the primaries and secondaries yields tertiary colors such as blue-violet, brown, etc. Figure 3.4 shows a subtractive-mixing color wheel. Figure 3.4: Subtractive mixing of the primary pigment and dye colors.